Happy Birthday to The Oyster Bed! Your Gift: adding some SIZZLE to your steak with The Steak Bed! Three years ago tonight, The Oyster Bed launched on Kickstarter becoming, at the time, the highest funded Kickstarter Campaign in Louisiana History! Since then, we’ve been really busy growing our family of loyal customers into the thousands AND growing the number of people and organizations who have become fans of our company and its cookware…and this includes CHEFS! The secret to a juicy steak is letting it rest…on The Steak Bed! Over the past three years we’ve been blessed with incredible friendships and relationships made in the culinary and coastal conservation industries. We’ve had the chance to help both of these industries through the use of our products, through donations, and through the use of our time and company as a platform to educate consumers about the value of seafood and our coastal estuaries – two things most Americans love! While most Americans love seafood, just about ALL Americans LOVE STEAK – so we were really excited when one of our good friends, Chef Brody Olive approached us about creating an entirely new product to help prepare and serve steak in restaurants and at home! First, Louisiana native Ruth Fertel (founder of the world-renowned “Ruth’s Chris” steakhouse) pioneered this technique so that her customers could see, smell, and hear the sizzle of their steak and enjoy it hot during the whole dining experience. The second, and more “technical” reason is that a steak needs time to “rest” for 5-7 minutes before being served – enabling the juices (which migrated to the cooler center during the cooking process) to be redistributed throughout the steak. The Steak Bed provides the perfect solution. It is resilient to 1000 degree heat, stays hot for 20+ minutes, and is designed with a special reservoir for the “au jus sauce” – the actual drippings from the cooking steak! Finally, just like our Oyster Bed can be used to cook more than oysters, The Steak Bed can be used for preparing much more than just steak! Stay tuned to our FaceBook page for an announcement about the availability of this outstanding product! Today, on the 241st birthday of the United States Marine Corps, The Oyster Bed would like to honor Marines and ALL VETERANS during this 2016 Veteran’s Day. So many men and women have sacrificed so much for our nation’s people to enjoy freedom and prosperity and often times these patriots have imparted the good will of America on people of good will around the rest of the world. Sometimes these brave men and women have also had to do battle against those around the world who fight against our country and the principles upon which it was founded. For those warriors who have given the ultimate sacrifice in the fight against evil, we are eternally grateful. Since photos are worth much more than words, we’re sharing just a few of Oyster Bed Co-Founder Tommy Waller during some of his many deployments around the world, which spanned Afghanistan, Iraq, Africa, and Central America. We hope this gives The Oyster Bed’s customers and friends just a small taste of some of the ground covered prior to the birth of this great small business. We hope and pray that the Lord grants us many more miles to cover with The Oyster Bed, many miles of coastlines protected by an ever increasing number of recycled oyster shells, and many more brave men and women who will volunteer their services in the defense of this great nation. 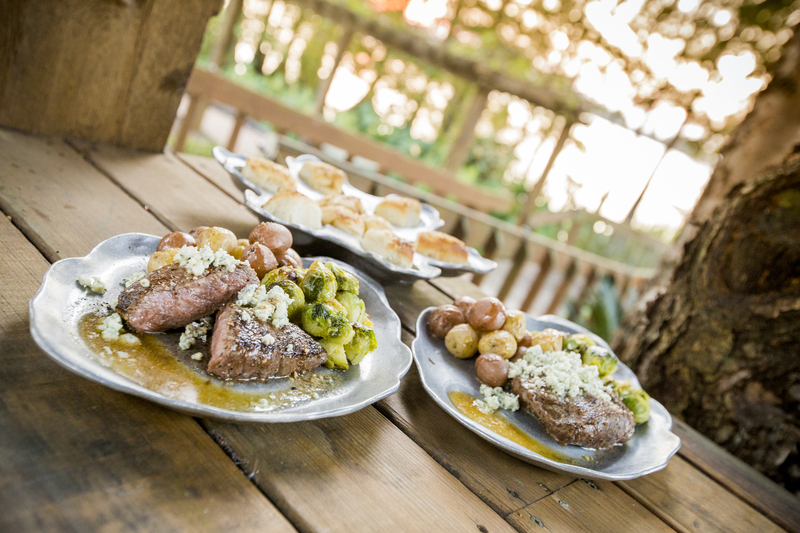 With warmer weather setting in, what better way to kick off outdoor parties than with a little grilling? One of our absolute tride-and-true favorites is, of course, an Oyster Bed full of the traditional yummy goodness of charbroiled oysters. Warm olive oil in saucepan over low heat. Add minced garlic, black pepper, Italian seasoning, and chopped parsley until well-incorporated. Pour mixture over softened butter and mix well. Add oyster meat to the Oyster Bed cooking wells and place on grill over high heat. While cooking, spoon butter mixture over each oyster. Once butter mix is gathering in cooking well, use a long-handled spoon to re-baste each oyster. Combine cheeses and distribute liberally over each oyster. Excess butter can be reserved for sauce or used to create flames for additional smoke flavor. Make sure to save enough in the reserve well for dipping! Cook until cheese reaches desired brownness while re-basting to build flavor. Serve with French bread, eat, and repeat! Out in the water, oysters actually grow together – that’s why they’re called “oyster reefs.” One of our biggest “WHYs” for what we do what we do here at The Oyster Bed is to raise awareness about the importance of conserving oyster shells so that they can be recycled back into our Gulf waters. The Coalition to Restore Coastal Louisiana (CRCL) is doing just that right in our backyard! When the adult oysters spawn, the baby oysters settle back down on the adult oyster shells – it’s one of their favorite places to grow! The new babies (called spat) like anything that is calcium based. Basically, out in nature, all the oysters “are in it together”–where the older oysters provide a safe haven for new babies that are spawned. Only about 1% survive of what’s spawned naturally. They settle on anything calcium based, preferably oyster shells. SO, with that being said, THIS is one of the biggest “WHYs” behind The Oyster Bed. By buying and serving pre-shucked oysters, you are contributing to the stockpiling of the shells and ensuring that they go back to the fisherman, and ultimately, back into our estuaries. The Result: more oysters, more reefs, more land. The photo above is actually a photo of one of TOB’s co-founders, Tommy (pictured middle), along with a couple of his Marines after a USMC Dive Training. As we continue to grow, want to share this “product with a purpose” with restaurants and retailers across America so that we can continue to reshape our nation’s tables and coastlines … one Oyster Bed at a time! Recently, we had the utmost pleasure of being served one-of-a-kind dishes at Jackson’s Steakhouse in Pensacola by founding executive chef Irv Miller. What made his absolutely delicious dishes even better? Chef brought them out to us on our very own Oyster Bed! Not only is Chef Irv Miller a mastermind of flavor in the kitchen, he also has written a new book entitled Panhandle to Pan filled with recipes and stories unique to the Gulf Coast. We’ve whipped up several of the recipes in it at home already and are huge fans. We highly recommend the book as a staple in your own kitchen or as a great gift for anyone you know who loves to get their cook on! You can find the book, here. If you are unfamiliar with Jackson’s Steakhouse in Pensacola, we highly recommend giving it a go next time you’re in the area! Ever wondered which of your favorite brewskies would be most palatable to pair with a fresh serving of oysters? Us too! So we took the opportunity to do a little research, visit a local brewery, and get the best scoop for you! For years the pairing of dark stout beer with oysters has been commonplace for the exemplary taste notes that are exuded from both. With Stouts being so lovingly appreciated by the Irish, we felt what better than to discuss the finer points of pairing beer from one of our favorite local breweries with oysters on St. Patty’s Day? Co-Founder of TOB, Adam, had a blast visiting Gnarly Barley Brewery the other day and chatting with Owner and Lead Brewer Zac Caramonta about what goes into his brews and his particular love for pairing oysters with a good stout. As we were visiting with Zac and discussing the realm of oysters and beer, he let us in on a little secret. Turns out, Zac found oysters completely unpalatable until he developed a genuine love for beer and decided to give them a go while paired with a quality-brewed stout. We love his story particularly because any “foodie” knows a great pairing of certain tastes can change the way our senses react to a particular thing. So, with our love for both oysters and beer, we found Zac’s story completely AWESOME! Fun fact for those of you who didn’t know: A Cicerone is essentially for beer what a Sommelier is for wine. Basically a career craft beer lover. Can we all have this job? Of course, we just HAD to ask Zac which one of his own brews he’d pair with oysters, and without hesitation, he recommended Gnarly Barley’s Korova Milk Porter. If you haven’t tasted this smooth, dark brew, we HIGHLY recommend giving it a whirl–with or without oysters. Of course, we’ll be having ours with! Also, STAY TUNED as we will be announcing something super exciting with good food, good booze, and good people as we gather for loads of fun with an event pairing The Oyster Bed and our friends at Gnarly Barley Brewery! CELEBRATE ST. PATTY’S DAY THE OYSTER BED WAY WITH A 15% OFF COUPON! ENTER “LUCKY16” AT CHECKOUT THROUGH SUNDAY, MARCH 20, 2016 TO REDEEM. With St. Patrick’s Day this Thursday, we thought it only appropriate to share some of our favorite GREEN oyster dishes with you this week. First on the list, and also included in our downloadable cookbook, a classic favorite: Oysters Rockefeller. These are incredibly quick and simple to prepare and a nice precursor to any meal. Melt 4 Tbsp. butter in large, heavy skillet over medium high heat. Add celery, onions, green onions, parsley and garlic. Saute’ until softened – about 3 to 4 minutes. Next deglaze sauce pan with Herbsaint. Add spinach and cook until wilted. Add black pepper, white pepper and breadcrumbs to spinach mixture.. Remove from heat and puree mixture in food processor. Melt remaining 2 Tbsp. butter in saucepan and add reserved oyster liquor to deglaze. Place oysters in the cooking wells of The Oyster Bed. Top each generously with pureed topping. Spoon remaining butter sauce over topping evenly. Finish with a pinch of freshly grated parmesan. Bake for 20 minutes. Serve with lightly toasted French bread and softened butter. **Herbsaint is a brand name of anise-flavored liquor currently produced by the Sazerac Company and originally made in New Orleans, Louisiana. In the “oyster world” and especially as we are located on the beautiful Gulf Coast, it seems that we are never short of eventful happenings involving seafood. We are SO excited that this weekend an especially notable event will be held for the first time ever in New Orleans. The event will take place March 10th-13th at the Old U.S. Mint in New Orleans and will host TONS of fabulous local and visiting chefs, along with copious amounts of great food, forums, and entertainment. One of the main topics discussed at the event will be coastal erosion. As you may know, this a HUGE why of our own mission statement hear at The Oyster Bed, so we are extremely passionate about the gathering of great minds to discuss this at Slow Fish 2016. We can’t wait to hear how these great minds will come together to discuss oyster shell recycling and supporting sustainable Gulf Seafood. If you’re looking for something to fill your belly and mind with this weekend, this is a great event to check out! With it being Lenten Season, we’ve been finding even more innovative new ways to cook on our Oyster Bed. This past Friday we had the family over for grilled fish and decided to get creative with some stuffed avocados as a side. Let me tell you, not only was this SUPER easy to throw together, it’s fairly healthy too! Cut the avocados in half and remove the seeds. Scoop out a bit of the inside so that the hole is big enough to fit the toppings and egg. Lay them hole facing up into The Oyster Bed. Put a TBSP of cheese in each hole. Dice up your jalapenos and disperse them evenly into each avocado. Crack an egg on top of each. Sprinkle desired amount of sea salt, cracked black pepper, and red pepper flakes to each. Bake for 15-18 minutes, or until the egg white is cooked, but the yolk still slightly runny. You can also bake at 400 degrees for 10 minutes–just keep checking it every few minutes to make sure it’s cooked to your liking. Other toppings would be great like bacon, crushed croutons, or chives. GET CREATIVE! If you do get creative, be sure to share your Oyster Bed adventures with us on social media! You can hashtag your Oyster Bed cooking adventures on Instagram, Facebook, and Twitter with the tag #oysterbedathome. Who knows, we may even post your fabulous ideas, and give you credit, of course!